Can you identify the house in this photograph? 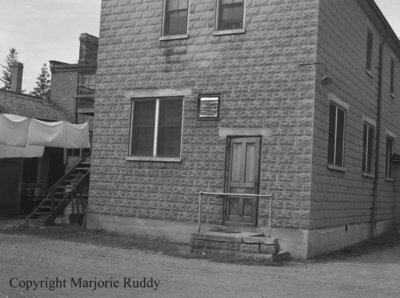 A black and white negative of the back of an unidentified cinder block house in Whitby, Ontario. In this view sheets are hanging on a clothing line to the left of the house. Unidentified House, September 28, 1945, Marjorie Ruddy. Whitby Archives A2013_040_1001.